British naturalist, born at Douglas, in the Isle of Man, on the 12th of February 1815. While still a child, when not engaged in reading, or in the writing of verses and drawing of caricatures, he occupied himself with the collecting of insects, shells, minerals, fossils, plants and other natural history objects. From his fifth to his eleventh year, delicacy of health precluded his attendance at any school, but in 1828 he became a day scholar at Athole House Academy in Douglas. In June 1831 he left the Isle of Man for London, where he studied drawing. In October, however, having given up all idea of making painting his profession, he returned home; and in the following month he matriculated as a student of medicine in the University of Edinburgh. His vacation in 1832 he spent in diligent work on the natural history of the Isle of Man. In 1833 he made a tour in Norway, the botanical results of which were published in Loudon's Magazine of Natural History for 1835-36. In the summer of 1834 he devoted much time to dredging in the Irish Sea; and in the succeeding year he travelled in France, Switzerland and Germany. Born a naturalist; and having no relish for the practical duties of a surgeon, Forbes in the spring of 1836 abandoned the idea of taking a medical degree, resolving to devote himself to science and literature. The winter of 1836-37 found him at Paris, where he attended the lectures at the Jardin des Plantes on natural history, comparative anatomy, geology and mineralogy. Leaving Paris in April 1837, he went to Algiers, and there obtained materials for a paper on land and freshwater Mollusca, published in the Annals of Natural History, vol. II p. 250. In the autumn of the same year he registered at Edinburgh as a student of literature; and in 1838 appeared his first volume, Malacologia Monensis, a synopsis of the species of Manx Mollusca. 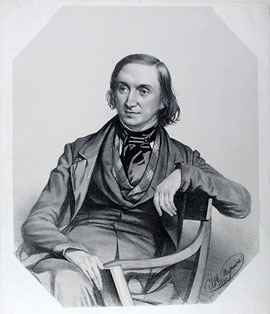 During the summer of 1838 he visited Styria and Carniola, and made extensive botanical collections. In the following autumn he read before the British Association at Newcastle a paper on the distribution of terrestrial Pulmonifera in Europe, and was commissioned to prepare a similar report with reference to the British Isles. In 1841 was published his History of British Star-fishes, embodying extensive observations and containing 120 illustrations, inclusive of humorous tail-pieces, all designed by the author. On the 17th of April of the same year Forbes, accompanied by his friend William Thompson, joined at Malta H.M. surveying ship "Beacon", to which he had been appointed naturalist by her commander Captain Graves. From that date until October 1842 he was employed in investigating the botany, zoology and geology of the Mediterranean region. The results of these researches were made known in his "Report on the Mollusca and Radiata of the Aegean Sea, presented to the British Association in 1843", and in Travels in Lycia, published in conjunction with Lt. (afterwards Admiral) T.A.B. Spratt in 1847. In the former treatise he discussed the influence of climate and of the nature and depth of the sea bottom upon marine life, and divided the Aegean into eight biological zones; his conclusions with respect to bathymetrical distribution, however, have naturally been modified to a considerable extent by later explorations of the deep seas. Towards the end of the year 1842 Forbes, whom family misfortunes had now thrown upon his own resources, sought and obtained the curatorship of the museum of the Geological Society of London. To the duties of that post he added in 1843 those of the professorship of botany at King's College. In November 1844 he resigned the curatorship of the Geological Society, and became palaeontologist to the Geological Survey of Great Britain. Two years later he published in the Memoirs of the Geological Survey, I, 336, his important essay "On the Connexion between the distribution of the existing Fauna and Flora of the British Isles, and the Geological Changes which have affected their Area, especially during the epoch of the Northern Drift." It is therein pointed out that, in accordance with the theory of their origin from various specific centers, the plants of Great Britain may be divided into five well-marked groups: the W. and SW. Irish, represented in the N. of Spain, the S.E. Irish and S.W. English, related to the flora of the Channel Isles and the neighboring part of France; the S.E. English, characterized by species occurring on the opposite French coast; a group peculiar to mountain summits, Scandinavian in type; and, lastly, a general or Germanic flora. From a variety of arguments the conclusion is drawn that the greater part of the terrestrial animals and flowering plants of the British Islands migrated there, over continuous land, at three distinct periods, before, during and after the glacial epoch. On this subject Forbes's brilliant generalizations are now regarded as only partially true (see C. Reid's Origin of the British Flora, 1899). In the autumn of 1848 Forbes married the daughter of General Sir C. Ashworth; and in the same year was published his Monograph of the British Naked-eyed Medusae (Ray Society). The year 1851 witnessed the removal of the collections of the Geological Survey from Craig's Court to the museum in Jermyn Street, and the appointment of Forbes as professor of natural history to the Royal School of Mines just established in conjunction therewith. In 1852 was published the fourth and concluding volume of Forbes and S. Hanley's History of British Mollusca; also his Monograph of the Echinodermata of the British Tertiaries (Palaeontographical Soc.). In 1853 Forbes held the presidency of the Geological Society of London, and in the following year he obtained the fulfilment of a long-cherished wish in his appointment to the professorship of natural history in the university of Edinburgh, vacant by the death of R. Jameson, his former teacher. Since his return from the East in 1842, the determination and arrangement of fossils, frequent lectures, and incessant literary work, including the preparation of his palaeontological memoirs, had precluded Forbes from giving that attention to the natural history pursuits of his earlier life which he had earnestly desired. It seemed that at length he was to find leisure to reduce to order his stores of biological information. He lectured at Edinburgh, in the summer session of 1854, and in September of that year he occupied the post of president of the geological section at the Liverpool meeting of the British Association. But he was taken ill just after he had commenced his winter's course of lectures in Edinburgh, and after not many days illness he died at Wardie, near Edinburgh, on the 18th of November 1854.